2011: Celebrating 40 years of success! We've changed a lot over the years! The Superannuated Teachers of Ontario, as it was called at the time, came into being in 1968 to protect pensions of all Ontario retired teachers. 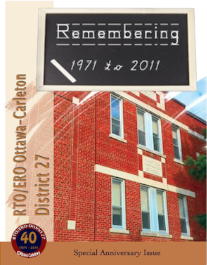 RTO/ERO District 27 Ottawa-Carleton was created in 1971 and has been actively involved locally and provincially in pensions, benefits, goodwill and travel. Over 250 members and guests gathered at the Confederation Education Centre on October 4th to celebrity District 27's 40th Anniversary. The reception not only featured the 80 plus members and its past presidents, it also highlighted the members of the Board of Directors who have served diligently over the past fifteen years. Imagine the vision of the founding members of RTO/ERO’s District 27 some forty years ago. They wanted to be part of a provincial association which lobbied on behalf of retired teachers and retirees in general. Today, District 27 continues to successfully serve almost 4,000 members of which 733 are aged 80 and over. District 27 is very proud of its "senior seniors" and its six centenarians. Lise Routhier Boudreau, past president of both AEFO and the French and Acadian Communities, joined the celebrations. In 2010, she received "l'Ordre de la Pléiade" for her outstanding contribution to Ontario's Francophonie, and, in September, 2011, she was the recipient of "l’Ordre de la Francophonies des Amériques." As well, Lise recently joined the Honourary Advisory group for the RTO/ERO Charitable Foundation. Joan Murphy, Provincial President of RTO/ERO, brought greetings from the Executive. The Entre-Nous Choir, along with other entertainers, presented a bilingual program especially prepared for the occasion. Artists, writers and musicians— all retired teachers — were featured as well. Members of the 40th Anniversary Committee gave freely of their time to mark the occasion, for which they are to be commended. Committee members would like to thank all volunteers too numerous to name. It was good to see so many gathered to celebrate 40 years of success with us. The chart on the right shows just how many District 27 members are over the age of 80 years. The total is an astounding 733! District 27 has many creative artists, writers and musicians. Our logo reflects RTO/ERO's signature gold and royal blue colours in combination with 40th Anniversary ruby-red.